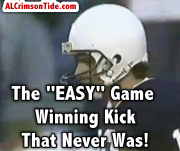 VIDEO: 1989 – Penn State’s “EASY” Game Winning Kick That Never Was! Alabama vs. Penn State has had its epic battles over the years, and I will never forget this Alabama / Penn State game in 1989. Penn State's RB Blair Thomas had marched down to the 1 yard line of Alabama. With a 17-16 lead, Joe Paterno opted for the seemingly easy game-winning field goal by Ray Tarasi. At the time it seemed that all hope was lost, however Alabama's 6 foot 7 inch Thomas Rayham found the intestinal fortitude to break through the line and put a hand on the potential 17 yard game winning kick. It was blocked, and Alabama won the game to put down the upstart Nittany Lions. The jubilation on Alabama's sideline was evident as you seen the agony of defeat on Penn State's side. The effect was a hush that went all over Beaver Stadium that day, and the shouts of "Roll Tide" to be heard in the heart of Dixie as well as the words of "He Blocked It, Eli!" being shouted on the Alabama radio network. Simply scintillating! How sweet it was on that cool autumn day in the heart Pennsylvania, with the Crimson Tide showing the heart of an "elephant!"